46 units of 30 ton capacity (Nos 1 - 45) built at Newport Workshops in 1907. 100 of 31 ton capacity (Nos 46 - 145) were built at Newport Workshops in 1950 - 51. Recoded VHWA. 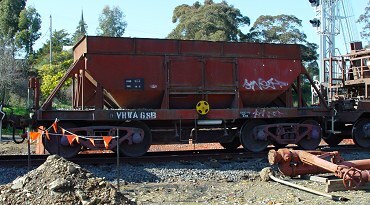 On loan to South Gippsland Railway to mid 2003, transferred to VGR for use on Muckleford - Castlemaine Junction Project. 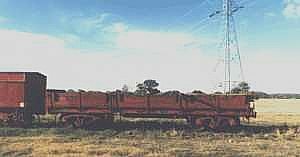 From 6.5.2004 on hire to John Holland for use on Fast Rail Project. 1925 Built at Newport Workshops for Commonwealth Oil Refineries Coy. One of four identical units. 3000 gallon capacity single compartment tank with bottom outlet. 1934 Modified for Alliance long top automatic coupling. 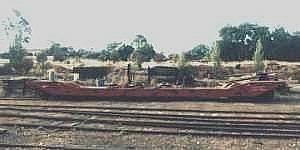 In VGR service as Loco. Fuel Oil storage tank. Notes: Bears identification as BP tank (successor to C.O.R.). This riveted tank is anchored against longitudinal displacement on the steel underframe by wooden beams and steel rods in tension. Notes: Welded tank without longitudinal displacement bracing as on 19 above. 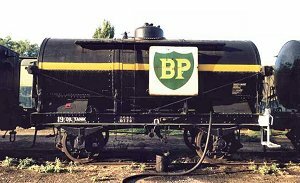 One of 16 similar tank wagons built at Newport Workshops 1926-27 for the Shell Oil Company. This unit is a 4500 gallon single compartment tank with top and bottom outlet. A total of 45 (poss. 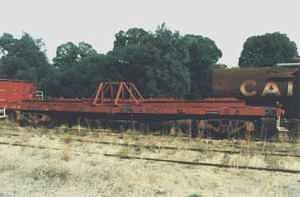 51) units built at Newport Workshops. Nos 1 - 25, 1953-54 and Nos 26 - 45, 1958-59. Westinghouse brake & automatic coupling fitted from new. 1954 Built at Newport Workshops. First QB was built in 1902 as a boiler transport wagon. 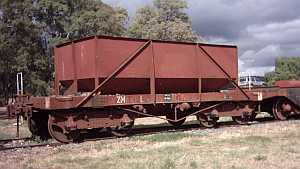 91 of these 26 ton capacity ballast hoppers built at Newport Workshops between 1910 and 1913. Westinghouse brake fitted from new. 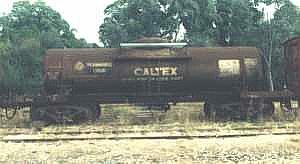 Used for ballast and rail transport. 1911 Built at Newport Workshops. 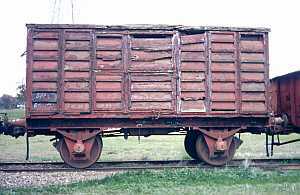 26 ton capacity bogie open wagons with wooden drop sides, used for general goods and sleeper transport. 201 units built between 1889 and 1892. Recoded VOWA under National Rail Vehicle Code. 1892 Built by Railways Department at Braybrook. Trussed underframe. 30 units of 31 ton capacity built at Newport Workshops in 1927 (Nos 377 - 406). An additional unit built in 1930 (No 407). For the transport of perishable goods such as fruit, milk, eggs, fresh meat and live animals in crates. 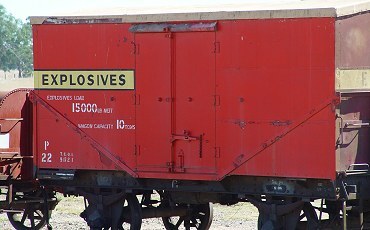 U 102 Timber body unit. 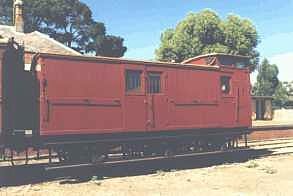 One of 37 units built at Newport Workshops between 1888 and 1896. 1957 - Converted for use as mobile carpenters van and renumbered to HD49. 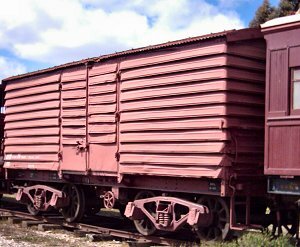 60 units altered from fixed wheel 15 ton 'U' vans at Newport Workshops in 1933 to permit running on passenger trains without speed restriction of fixed wheel vehicles. 1915 Built at Newport. 2000 gallon all riveted tank for transport of water for Domestic Use. WT 229 - 1500 gallon tank on I wagon with doors removed. WT 531 - 2300 gallon tank on frame of earlier vehicle.